To protect the lives of inhabitants, buildings are designed to sway and deform without collapsing in response to earthquake shaking. Many building owners and occupants also expect that, with a modest level of repair, buildings will be usable after a strong earthquake. To achieve these objectives, engineers take great care when designing and detailing structures located in regions of high seismic hazard. Unfortunately, to ensure that structures have the desired deformation capacity, a large amount of specially detailed reinforcing steel is often required. In certain cases, the reinforcing steel that is required can be difficult and time-consuming to assemble, resulting in greater cost and duration of construction. What if there was a better way? What if a structure could be constructed in less time and at lower cost, but still exhibit the same deformation capacity? Furthermore, what if this structure tended to exhibit less damage after an earthquake than is typical of current construction? Researchers at the University of Michigan and the University of Wisconsin-Madison have been evaluating whether these goals can be achieved through the use of fiber reinforced concrete in earthquake-resistant construction. Fiber reinforced concrete (FRC) refers to concrete that has short fibers mixed evenly throughout the material. The research team used 1.2 in. long steel fibers with a 0.02 in. diameter made out of a high-strength steel wire. The fibers were mixed into the fresh concrete before it was poured into the formwork. These short fibers, which disburse randomly throughout the mixture, act like distributed reinforcement that holds the concrete together after it has cracked. The research team focused on studying the use of FRC in walls and coupling beams (coupling beams are used by engineers to link adjacent walls together and thereby stiffen tall structures). Isolated walls and coupled walls are commonly used in medium- and high-rise buildings located where there is a high seismic hazard. Construction of coupled wall systems can be difficult because of the need for a large amount of reinforcing steel that can be difficult to construct due to interference issues. Tests were conducted on large-scale specimens to evaluate the performance of walls constructed in a manner consistent with current practice and walls constructed with FRC. The specimens were built to approximately 1/3 of full-scale and then subjected to reversing lateral displacements to simulate earthquake loading. Results from this research showed that when walls and coupling beams are constructed with the FRC used in this project, reinforcing steel can be reduced significantly in the walls and coupling beams (by up to 40% in coupling beams) without compromising behavior. The FRC members had the same or better deformation capacity and showed less damage after testing than the members constructed without FRC. It therefore seems plausible that use of FRC in construction will allow for the use of less and simpler steel reinforcement while maintaining good structural behavior and potentially reducing the amount of post-earthquake repair. Such results will lead to a cheaper way to construct safe buildings with reduced life-cycle costs for the owner. 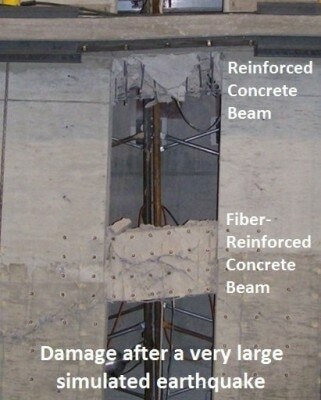 This research can be found in a paper with the title “Seismic Response of Fiber-Reinforced Concrete Coupled Walls,” published in the May-June edition of the ACI Structural Journal.